Hartpury move into the final four games of the Greene King IPA season knowing that only a continuation of their current good form will be enough to give them a chance of survival. Last weekend saw them clinch a famous away win at third-placed Jersey, a side they had not previously beaten, to lift themselves off the foot of the table, only for immediate rivals Richmond to achieve an even better result – in terms of league points – 24 hours later, against a Nottingham team who had very little to play for. However, with three wins in the past four fixtures, including a bonus point win over Richmond, the Red & Blacks have done almost everything in their power over the past few weeks to give themselves a fighting chance. The victory in the Channel Islands was described by experienced Head Coach, Mark Cornwell, as probably the biggest of his coaching career and there is no doubt that it represented a high point in Hartpury’s Championship experience so far. An early Jersey interception try could have unsettled the visitors, but they quickly responded through their exemplary skipper, Simon Linsell. Late in the game, young fly half Sam Leeming showed nerves of steel to wrap up the win with a late penalty kick. Throughout the game Hartpury played with purpose and composure, defending hard when necessary. Of the remaining games, two are at home, starting with Saturday’s crunch encounter against another highly-placed team, Bedford Blues – fourth, and now level on points with Jersey. The reverse fixture at Goldington Road, back in October, was a heart-breaker for the Gloucestershire side who were leading until late in the game before a late Bedford try, and a missed penalty kick of their own, left them with only a couple of bonus points as consolation. It was a very similar story at Hartpury last season when, again, a last-gasp Bedford try snatched the win. 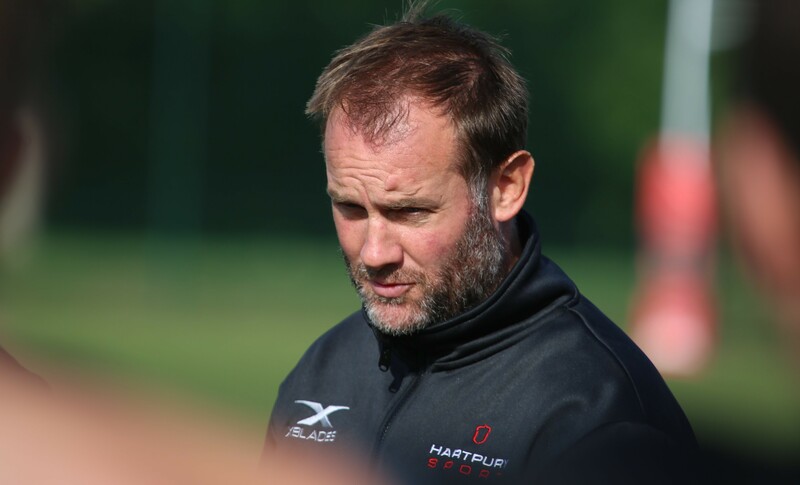 Hartpury Director of Rugby, John Barnes (pictured), is happy with his squad’s current form, but knows that those recent results will mean little against the Blues. “We are expecting to another big test in playing Bedford at home on Saturday,” he said. “Bedford will pose a different threat to Jersey,” he said. The only cloud on the horizon is the somewhat untimely return of the Premier Shield (formerly known as the A-League). This unloved competition has the capacity to rob Hartpury of one or two of their recent strong performers, meaning that the club will leave it until the last possible minute before naming the squad to face Bedford.